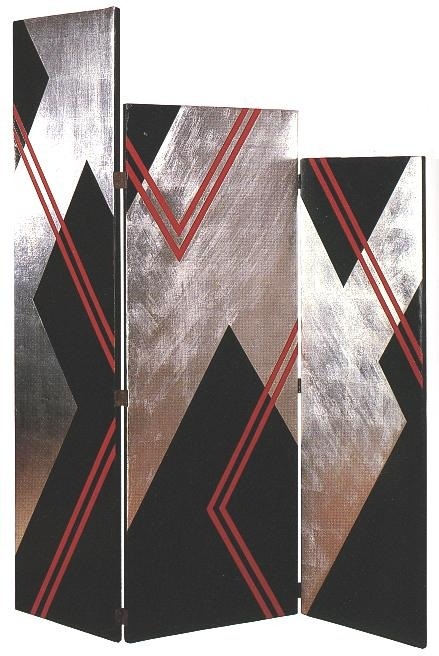 Deskey was a superb and prolific Art Deco designer, and this screen was perhaps his most striking piece. 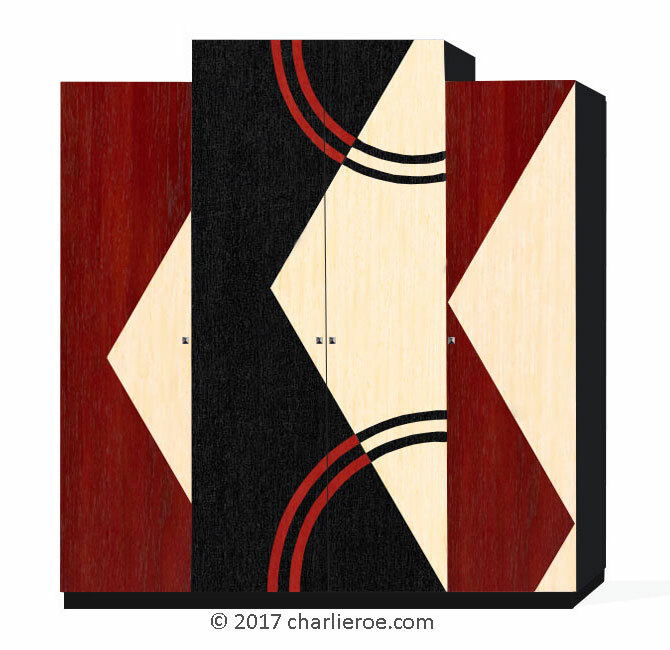 This is a copy of one of his screens designs, c.1929. It is very typical of his best work, the colours and designs were used in several media. 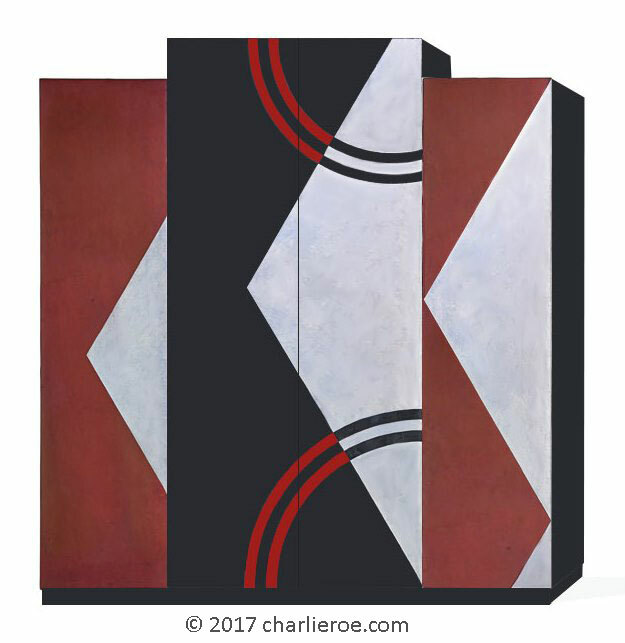 The use of rich colours in the cubist zigzag patterns & the stepped 'Skyscraper' profile are so typical of Art deco. The interesting way the screen was used, ie folded at 3 angles, only served to emphasis the patterns on the screen. It has painted designs and a silver leafed finish on one side only. Made to order. More designs are shown below. We are putting together a whole range of furniture designs using Deskey's original screen. As a designer I can take a strong design like Deskey's and adapt it to many pieces. Shown above is a 2nd Deskey screen, from around the same time. Painted with Cubist shapes as well, but not as sucessful as the top one. But we could reproduce this if requested. 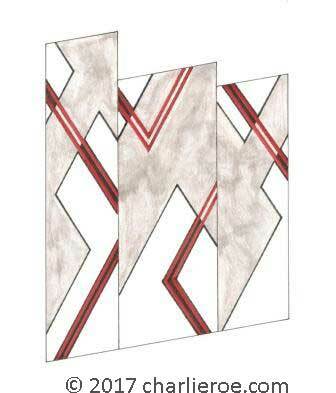 We have several other deskey screen designs we could for you as well. The interesting thing about showing the screen as a flat design is that it has never been published or photographed like this, althought this is how Deskey designed it. It looks strange to see it this way, but this is the best way to see the whole pattern at the same time. Even more interesting is showing the screen in various stages of design evolvement. Having done the original line drawing for the screen, deskey would have filled in the blocks of colour to show the finished design. What is striking, having followed Deskey's working method, is that some of the less finished versions are just as striking as the original painted screen. The above 2 screens show the addition of more colour building up the design. 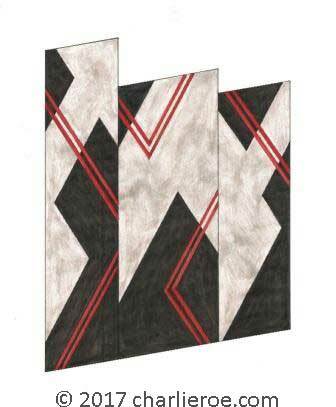 These are really striking versions of the screen, and would equally add a wow factor to an interior. The main difference in the two designs in that the right version has had the lines made thicker to emphasis the patterns. We could make any of these designs. This is another Deskey screen we adapted to a wardrobe/bookcase. We could of course supply it as a screen if you wanted, although there isn't much call for screens these days. 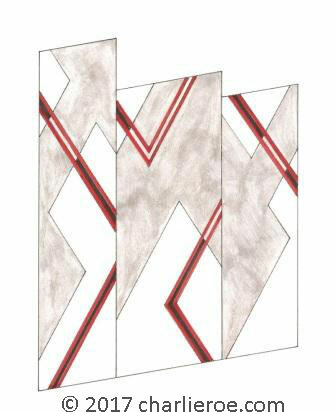 This is a stunning design with Geometric Cubist patterns in strong colours, it would definately make a focal point in any room. Made to order. We don't give out sizes or quotes until we've agreed a spec. with a customer. 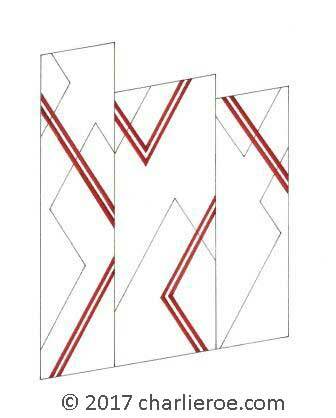 Instead of the painted screen you might prefer this made with wood veneers? We could supply the exact same screen but wood veneered, as shown above right. It has the same striking design, but is subtler in wood, which many people prefer.